Copper brown has always been my favorite shade when it comes to eye shadows. It is one particular shade that I can carry easily and comfortable without looking too simple. It looks elegant on eyes and instantly brightens up the eye area. 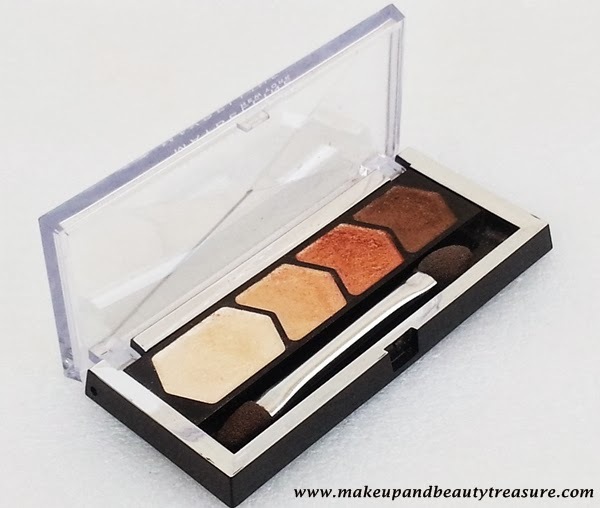 Today I am going to discuss my experience with Maybelline New York Diamond Glow Eye Shadow ’01 Copper Brown’. Maybelline New York Diamond Glow Eye Shadow ’01 Copper Brown’ comes in a black eye shadow palette with a sturdy clear flip top lid. The lid snaps shut satisfactorily and there is no fear of it being getting messed around in a makeup bag. The packaging is quite lightweight and fits easily in my small makeup bag. It contains a dual sided sponge applicator that seems pretty cheap and useless. There is unfortunately no integrated mirror in the packaging and I do need to carry my own compact mirror with me while traveling. The texture of the eye shadow is very soft, smooth and incredibly silky. Although the eye shadow is in powder form, it feels creamy whilst application. Application of the eye shadow is super easy. I love how it spreads easily all over my lids with absolutely no fall out. I simply sweep my eye shadow brush over the desired color and apply it over my eye lids. The eye shadow does not tend to fall over my cheeks unlike few other powdery eye shadows. It provides an even coverage without giving patchy look. The pigmentation is medium to build-able. With the darkest shade, I get the actual color with just one application but with the lighter shades I do need several applications to build up the color. With the primer underneath, I get true and vibrant shades with just few applications. Girls, do invest in a good primer. It really does make a difference in both pigmentation and longevity. The staying power is pretty amazing when used with a primer. I did an eye look (check out here) with this quad in my cousin’s marriage. The eye shadow stayed on my slightly oily lids for around 10 hours without fading or creasing. It is easy to remove with olive oil or a good makeup remover. Copper Brown consists of four shades. The lightest shade is perfect for highlighter or as a base for soft brown smokey look. The second shade is a light bronze shade with hint gold in it. The third shade is a mix of copper and bronze that looks pretty when used on its own. The last shade is a dark brown shade with fine gold shimmers. This is my favorite shade as it compliments my brown eyes and I love using it on its own. It instantly brightens up my eye area. All the shades have metallic finish to them and looks lovely with both day and night looks. Copper brown is suitable for all skin tones. • Soft, smooth and silky texture. 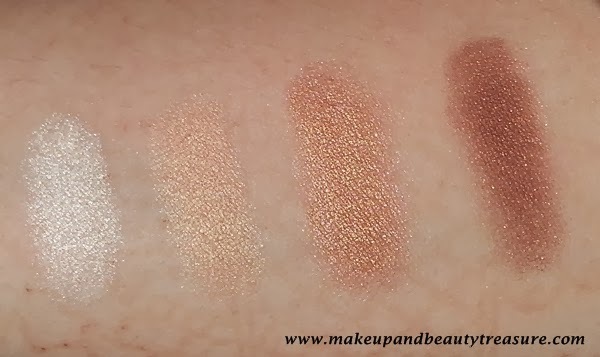 I am absolutely in love with this eye shadow quad. The colors are easy to apply and give an even looking finish. They blend effortlessly and have medium to build-able pigmentation. All the shades are gorgeous and look stunning on brown and black eyes. Overall I absolutely adore this quad from Maybelline and would happily recommend it to everyone. 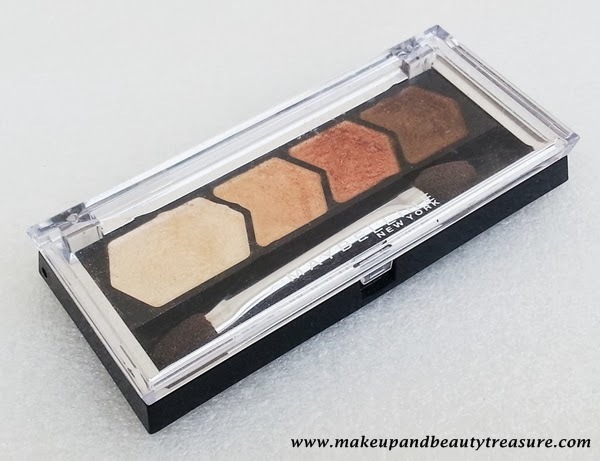 Have you tried Maybelline New York Diamond Glow Eye Shadow? How was your experience? Share in the comments section below! Grgs palette meghu. ..where is ur eotd??? .. This looks like a reincarnation of their famous Chai Latte..
Awwww i am so happy i was of some use to u :) I dont think as it contains shimmers! I have always avoided this because of the shimmers. But the staying powder is impressive. Might want to check these out again. Shimmers are very fine Nivi. Loved the palette and EOTD! I have it in Purple one.. but I am liking this one more.!! Thanx Poo. Yeah purple one is good too! Quite wearable shades! Palette is so beautiful! If u r fond of super pigmented shades then u l l not like it. the shades in here are super gorgeous megha!! i loved your eye look the other day too ! Thanx Rads! This one would look flattering on ur big eyes! I love this one...I have the LILAC MAUVE in this range, but looks like I need this one too. Lovely EOTD! Thanx dear. i so wanna try Lilac! Nice review. I have palette with different shades by Maybelline. It is nice, well pigmented :) But I also would like to have a mirror in it. Thanx Egle. i agree mirror is a must! Thanx Shalini. Oh dont worry shimmers are very fine. I have the same palette in a quad form. Mine is pretty pretty old. But exactly same shades and I love them. Yeah the shades are wearable n gorgeous.